If you are planning on dining here for dinner, be sure to make a reservation! This is one of Disney Springs' most popular restaurants. You can also make a reservation through the My Disney Experience app. Annual passholders will still receive their discounts no matter what way you book! The Boathouse is not just a restaurant, it's an adventure. Be prepared to stay a while to take in everything it has to offer! For example, they boast the world's largest collection of fully restored "Dream Boats", consisting of beautiful wood cris-crafts, Italian water taxis and stunning amphicars in pristine condition. When you arrive to the restaurant, there is an Amphicar Launch to the left side of the building. Tickets can be purchased in the "Boatique" gift shop. The tour takes about 30 minutes total is costs $125 per car that seats up to 4. We recommend taking the boat tour after your meal because you can receive a $25 discount on the ticket price with your receipt! Located on Lake Buena Vista in Disney Springs, you are guaranteed a stunning view from every table. We were seated inside at a window, overlooking the lake. There were boat slips along the back of the restaurant with seating along the entire dock and even though it was 91 degrees outside, it looked shaded and breezy enough to be comfortable. When we were seated, we had 2-3 people come by our table within the first minute or two to clear the extra place settings and set us up with waters. They were very subtle yet attentive! Our "Captain" Steve came by to introduce himself, to answer any questions and give us the breakdown of the day's specials. He was filled with interesting facts about the menu. (He was also VERY helpful in not only menu selections, but things to do on our day out at Disney Springs! Apparently he and his wife spend their weekends out on date nights trying out all the latest spots. When we asked his opinion of ordering a large plate like the famous $75 crab boil and spending the afternoon at the Boathouse vs a few small bites and trying out a few other spots, he was happy to give us a list of his favorites! Some of his recommendations we surprising, like the fact that the Splitsville bowling alley has the best sushi! ?, Homecomin' squeezes their own juices for their cocktails, and Morimoto Asia puts out a mean ramen bowl). Based on the light in Captain Steve's eyes, we decided to order small bites and a few drinks, though the crab boil was pretty tempting! Every plate that came to our table was absolutely delicious. The seasoning, flavors, fresh ingredients... it was everything we could've asked for. The Boathouse mahi tacos were ordered off of the specials menu - they are not part of the regular menu. They were DELICIOUS! 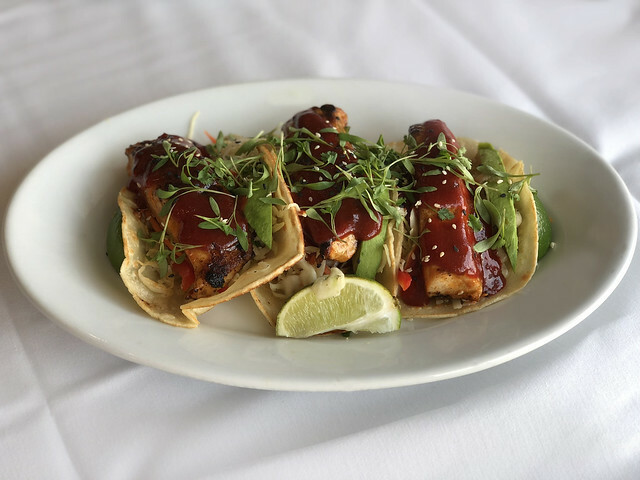 Fresh micro herbs, seared mahi, avocado and handmade tortilla shells topped with a spicy hawaiian barbeque sauce. We also ordered the Filet Mignon Sliders, located on the "sandwiches" section of the menu, served with two sliders and french fries. The "Maitre d' Butter" has fresh garlic and herbs and is AMAZING! The fillet is cooked to perfection and is so tender, it falls apart when you look at it! One final note: If you are comparing The Boathouse vs Paddlefish (the other steak & seafood upscale restaurant at Disney Springs), we would HANDS DOWN recommend the Boathouse. No questions asked. From the atmosphere to the food and drinks... it was truly a better experience.